Get more work done with fewer, more efficient IT resources. Get the performance you need to meet the business requirements for real-time data–from all your storage systems—including disk, flash, and NVMe. DataCore delivers the highest performance in a cost-effective way. 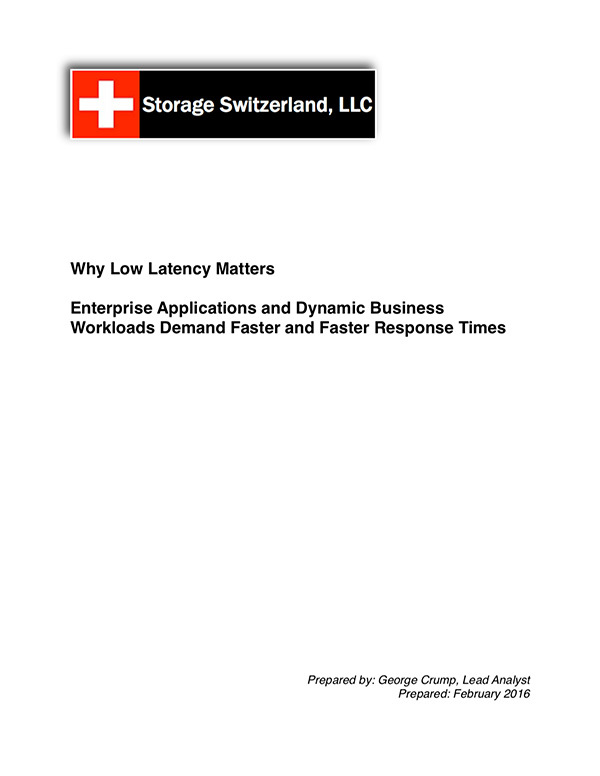 Dramatically increase IOPS, decrease latency, and deliver faster response times for your applications. DataCore speeds up your application’s response times using patented adaptive parallel technology, advanced caching, and I/O optimizations so that your end users see a significant improvement in overall application speed. DataCore set the SPC-1 benchmark record with a response time that was 363% faster than the next fastest, an all-flash array. 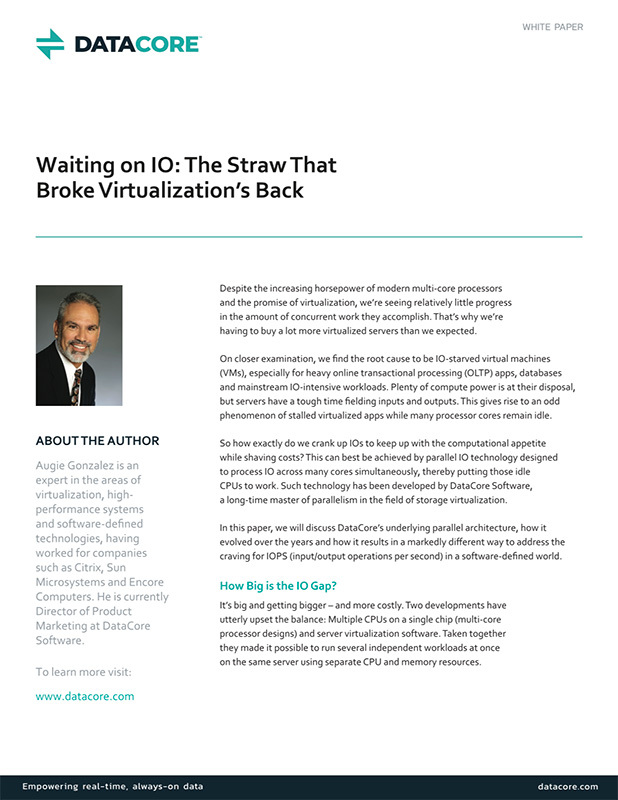 DataCore’s Parallel I/O technology, based on 20 years of research and development, maximizes utilization of multi-core processors to dramatically cut latency and removes I/O as the bottleneck in application performance. You don’t have to spend large amounts of money to achieve the performance gains your business needs. DataCore’s Real-Time Business Stack provides the industry leading price-performance, delivering the best value to companies. DataCore has 60% better performance for the price than the next best, as measured by the SPC-1 benchmark in dollars per IOPS. DataCore’s auto-tiering capabilities ensures that a mix of flash and spinning disk can provider better responsiveness and value than AFAs or Hybrid systems. Companies will get the best performance at a price that fits their budget. You don’t need to rip-and-replace your entire system to improve performance. Leverage DataCore to scale-up or scale-out your applications while efficiently using all your resources. 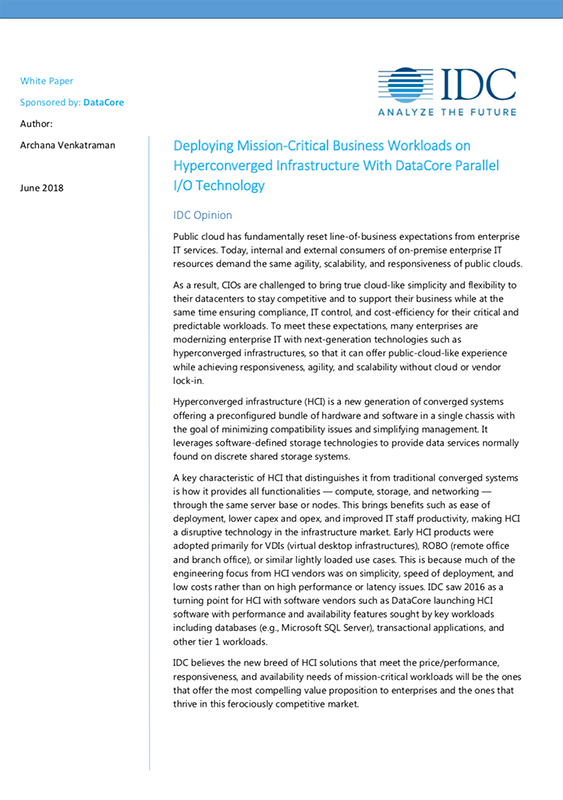 DataCore’s enterprise-class performance capabilities, like parallel I/O and caching, are used to speed up all applications. This provides quicker response times for individual applications by 20-50%. DataCore’s ability to utilize efficiently standard hardware (such as JBODs) as well as new technologies (e.g. NVMe) across any architecture, such as converged and hyper-converged, provides the flexibility to tailor performance to any application and budget. More efficient usage of hardware means that fewer nodes are needed, reducing hardware and licensing costs as well as reducing administrative time. Emergency Communications of Southern Oregon had a Microsoft SQL-based dispatch application that was running too slow. This slowed down the speed at which police, fire and other emergency services could be sent to people that needed help, putting lives in jeopardy. With DataCore, they were able to improve SQL Server response times by 20x. 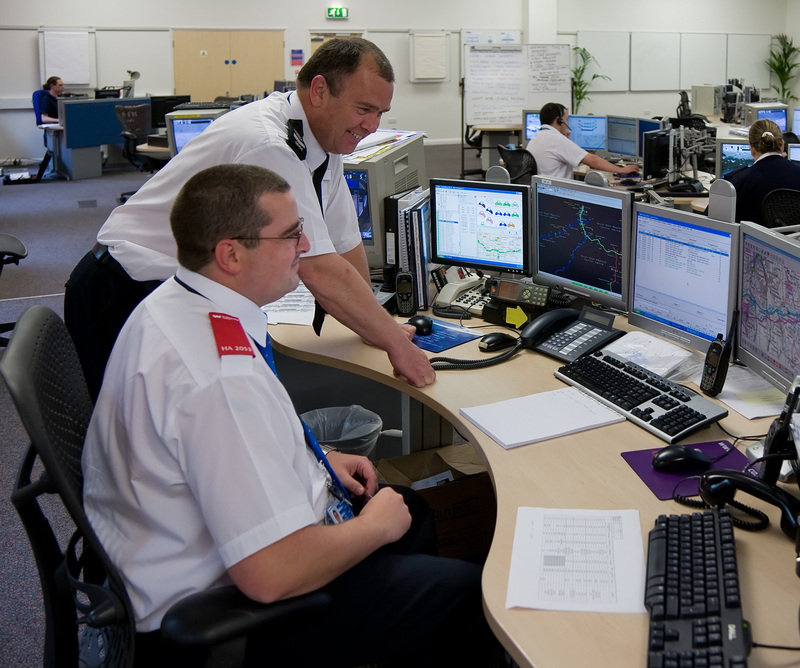 This improved performance also enabled them to consolidate their infrastructure and reduce costs. The 200 millisecond latency has gone away now with DataCore running. In fact, we are down to under five milliseconds as far as application response times at peak load. Under normal load, the response times are currently under one millisecond. Learn how DataCore’s performance optimization solutions drive the most I/O performance from your storage, proven by industry benchmarks.